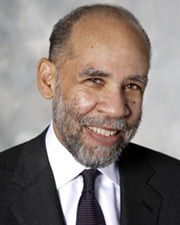 IntLawGrrls notes with great sadness the passing on March 22 of John A. Payton, the late President and Director-Counsel of the NAACP Legal Defense and Educational Fund and husband of IntLawGrrl and international human rights leader Gay J. McDougall. A memorial service in his honor was held on Monday, April 16, 2012 at the Washington Convention Center. The size of the venue should give readers some idea of the thousands of lives John Payton touched personally and professionally. He was a leading light for social justice and civil rights. Speakers and attendees included Supreme Court Justices Stephen Breyer and Elena Kagan, law school deans, the Attorney General of the United States, Eric Holder, Jr., and approximately 1000 other practicing lawyers, judges, legal academics, former law students, friends, and family. Among many others, Cecelie Counts, a former leader of the Free South Africa Movement, talked about McDougall's and Payton's commitment to the anti-apartheid struggle. See, e.g., Zoe Tillman, "John Payton, Champion of Equality, Remembered," BLT: The Blog of Legal Times, linked here with photos from the gathering..
Our heartfelt condolences to Gay McDougall and to John Payton's family, friends, and colleagues. He was such an inspiration to a patent lawyerlike myself and I know lawyers from other fields of practices that he has so dearly inspired by his compassion and expertise combined, which can be quite a gem in our profession. Eternal repose be on his soul.